Wendy has practiced primarily with our firm, however, in 2003 she entered public service for two years and served as Deputy Attorney General at the Division of Law and Public Safety representing the State of New Jersey and the New Jersey Division of State Police on civil rights and employment matters. Now Partner with the firm, Ms. Reek practices insurance defense litigation concentrating primarily on the defense of automobile negligence and premises liability personal injury cases. She has tried over 70 jury trials to verdict and in 2013 she became Certified by the Supreme Court of New Jersey as a Civil Trial Attorney. Wendy is regularly appointed as an arbitrator in UM/UIM matters as both a neutral and defense arbitrator, participates in the Mercer County mandatory non-binding arbitration program and the Middlesex County bar panel program. An active member of the New Jersey State Bar Association and its Civil Trial Bar Executive Committee, Wendy served as Chair of the Executive Committee from 2014-2016. She was President of the Middlesex County Trial Lawyers Association from 2014-2015; and is a member of the Middlesex County Bar Association, the Mercer County Bar Association, and the Hispanic Bar Association. She is a member of the American Board of Trial Advocates and is a Trustee for the Trial Attorneys of New Jersey and the New Jersey State Bar Foundation. 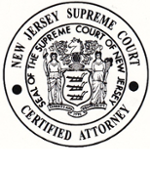 In 2011, Ms. Reek was honored to receive the Civil Trial Attorney Award presented by the Middlesex County Bar Association, in 2015 was included in the New Jersey “Super Lawyers” listing in New Jersey Monthly Magazine, and in 2018 she was honored by the Civil Trial Bar Section of the New Jersey State Bar Association with the James J. McLaughlin Award, which recognizes civility, professionalism and competence in the practice of law. Ms. Reek regularly participates as a speaker for NJ ICLE and is a member of the Continuing Legal Education Advisory Committee for the New Jersey State Bar Association. She is admitted to practice in the State of New Jersey, the U.S. District Court for the District of New Jersey, the U.S. Court of Appeals for the Third Circuit, and the United State Supreme Court.